Sheet Yeahh! It's that time of the month again. Uniquely structured, quite soft and smooth, designed with TENCEL® lyocell fibers, 100% cotton Percale, Pillow Guy’s sheets collection is ready to give you silk-like feel. Prevent you from night sweating and give you a sound sleep experience. How to take care of your sheets. So you’ve decided to treat yourself and splurged on some great Pillow Guy sheets. Now you’re wondering how often do you wash them? Do you even need to and if so how? Well the answer is most definitely a yes! We spend a third of our life sleeping and having a good night's rest is paramount to a productive day. A third of your life means taking care of your sheets is that much more important! So how do you make sure your great set of sheets that last the next ten years? How do you ensure that they stay clean, smooth, and don’t lose their texture? Fret not! Below are some tips to ensure your new luxury comfortable bedding looks and feels great after many years of use. This one’s key. Never wash your sheets with other items as washing them with other clothes can damage them. Those zippers for example can get caught in your sheets and cause them to rip! Larger loads can also cause them to become tangled up, stretched, and lose their structure. Ease up on the detergent use! Using a little less detergent than the recommended amount is key as they can be harsh on the fabrics. Try to use a natural laundry detergent whenever potential as those are milder. If your sheets are white/light in color and have a few stains, add one scoop of oxygen bleach to the water or bleach dispenser to help lighten the fabric and remove stains. 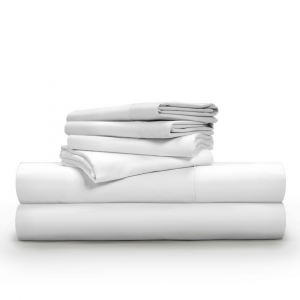 Always use a gentle cycle for your sheets as the regular setting can be too harsh on your sheets. For one set of sheets, we recommend setting the washer for a medium-sized load. Keep the temperate at a moderate level, we recommend at cold but anything below 105 degrees Fahrenheit should be fine. Avoid extremely hot water as it can be damaging to the cotton! Keep an eye on the spin cycle, since you’re only washing the sheets and nothing else - a full extended spin cycle is unnecessary. If possible, check halfway through the cycle to see if the majority of the moisture is out of the fabric already. If so, take them out for drying. Once the cycle is done and all the moisture is gone from the fabric. You can either leave them to dry naturally on a clothesline or use a dryer. We recommend the former. However, we know not all of us have that easy real estate or time! So before throwing your sheets in the dryer, do make sure to see if they are suitable for the dyer and not required to be air dried. If they can be dried using a dryer, place your sheets in the dryer along with some wool dryer balls. Avoid any drying sheets since the liquid in these can clog the cotton’s pores causing it to lose its comfort. Once in the dryer, dry them on a low heat or air cycle setting. Now how often do I need to do this? There you go, not as hard as you thought it would be right? Follow these simple steps and rest assured you won’t lose any sleep any time soon! Get the most comfortable and luxurious pillow collection at Pillow Guy. Explore the finest quality pillow filled with the superior cool hypoallergenic Poly Gel Fiber and built to last. 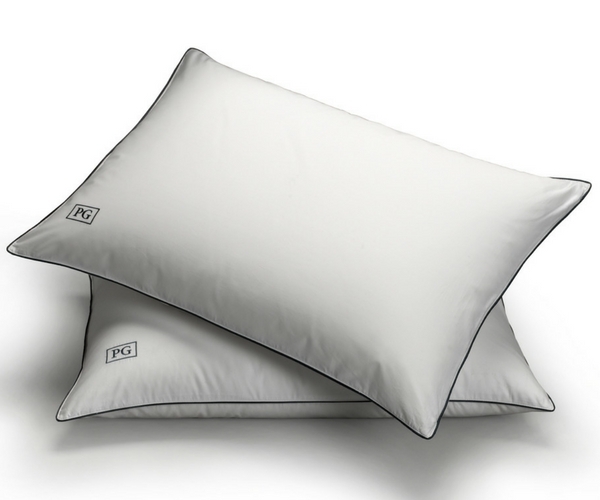 Each pillow covered in down-proof cotton shell. A good night's rest is a dream and one isn’t complete without your newly bought pillows. But as with any bedding you’re going to need to take care of your pillows regularly to ensure it maintains its texture, structure, and doesn’t turn that god-awful yellow color! With down pillows in particular, you’ve paid for the softness, but did you know they are also incredibly easy to maintain? Here are a few key steps to ensure your down pillows are getting the proper care they need, be it when it comes to washing, drying, or just general daily care. Always check if your down pillow is machine washable and if so ensure you wash two pillows at a time to keep your washer balanced during the spin cycle. Temperature wise, it’s good to go with warm water, too hot however and you can risk shrinkage of the fabric. Set the spin speed to the fastest possible to take as much moisture out of the pillow as possible and add an extra rinse cycle with no soap to ensure any detergent is gone. For detergents, a gentle non-bleach variety such as Tide Free is perfect! Avoid fabric softener as it can coat the down and reduce its fluff. When you’re done washing, your down pillow may give off a pungent odor. Don’t worry this is natural and will go away as the pillow dries up. How often should you wash your down pillows? The common rule is once or twice a year but in more tropical climates where you may sweat a lot at night, don’t hesitate to wash more frequently. Remember this is for your pillows, not pillowcases which should be washed much more frequently! When it comes to drying your down pillow it’s incredibly important that you ensure all moisture has evaporated. Down pillows can easily develop mold or mildew, so this vigilance is important! The general rule of thumb is 2 - 3 hours to fully dry two standard size down pillows. Use a large dryer and set to low or medium heat. Make sure there’s enough room in your dryer for the pillows to toss around as they dry as this helps kick out the moisture. Overheating is a risk and there’s a chance of burning your pillows fabric or down clusters. Check the dryer every 20 minutes to ensure this doesn’t happen. If you feel any clumping or still get a whiff of that pungent odor when checking, extend the drying cycle as this is a sign the pillows are still wet. Hand fluff your pillows when they are out of the dryer as a final check to see if they are damp inside. Always err on more drying time than less as sleeping on a damp pillow is not comfortable! It’s always good practice to have some daily routines to help increase the life of your down pillows. For example, fluff them daily by giving them a few shakes from end to end and side to side to help keep its shape. If you feel like your down pillow is losing its firmness, give it a quick spin in the dryer on low heat with some tennis balls to bring it back to life. Finally, invest in a pillow protector/pillowcase. It’s invaluable and can help stretch the life of your down pillows. Have it washed once a week in hot water as this is what’s going to catch all your body oils and perspiration. You do not want to be sleeping on that too long! Well there you have it, some simple techniques to help keep your down pillows clean, comfortable, and long-lasting - so you can get the quality sleep you need and tackle the day ahead at your best! The best comforters on the market specially prepared with 100% Certified RDS (Responsible Down Standard) Down at the most affordable prices with us. 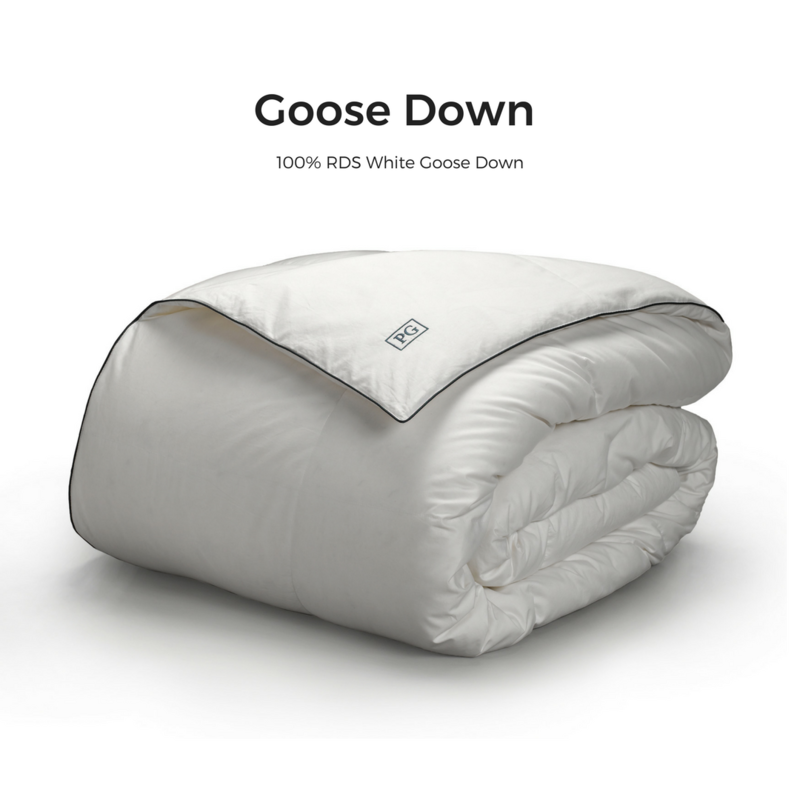 Pillow Guy is come up with All-Season White Goose Down Comforter will make you never want to leave your bed. If you’ve struggled to navigate the bedding maintenance world, we’ve probably got some tips here that’ll really help out. Especially when it comes to taking care of your down comforter it’s not as complicated as you think and natural Down in particular comes out of the wash beautifully. So what are the basics to ensuring your down comforter lasts many years to come? Firstly, start by checking whether your down comforter is machine washable as some can only be dry cleaned. If your comforter is machine washable, make sure you’ve only loaded the comforter and nothing else. Keep in mind, you’ll need a XL size front-loading machine and if the one you have at home is too small, the comforter can get tangled and damaged. Washing can also cause lumps of down in your comforter from the twists and turns which dyring and fluffing help remove later. Here at PillowGuy, our Goose Down Comforters come with Baffle Box construction to guarantee no shifting or lumping during washing! Add roughly a third of detergent and go easy on the soap as too much can be bad for the filling. Set it to wash on the delicate cycle, using cold water to avoid shrinkage, and a non-bleach detergent made for down, enzyme-free, and a natural variety. Just to be sure, run the rinse cycle twice with the second cycle using no soap to ensure all the pre-existing soap is gone! After it’s done washing you may notice a pungent odor. This is fine and is natural with all down products - it’ll go away as the down completely dries. As for how often, frequent washing can damage the down clusters in your comforter. We recommend a once a year if you don’t use a duvet cover. If you do, then a wash every 3 to 5 years might suffice and then just give your duvet cover a monthly wash instead! To dry your comforter takes usually 2 to 3 hours and it’s important to have your comforter completely dried to avoid any mold or mildew. It’s best to use a commercial dryer on low heat and ensure your dryer is big enough so the comforter has tons of room to toss and fluff out as it dries. As the heat can sometimes burn the comforter fabric, be sure to stop every 20 minutes and fluff out your comforter while checking for any burn signs or hot spots. If it does feel hot to the touch, adjust the dryer heat so it’s cooler. Pro tip - take a tennis ball or two, wrap it in a clean white sock and place it in the dryer. This will help fluff the comforter as it dries. The best way to keep your down comforter everlasting is by purchasing a duvet cover. This protects your comforter from everyday use and those nasty body oils you’ll be secreting each night! Secondly, always fluff! When making your bed, grab your comforter by the ends and give it a good shake. Avoid lying on top of your comforter as well, as this can cause the down clusters to break and make your comforter lose its warmth and fluffiness. Similarly when it comes to storing your comforter, use a cloth bag so your comforter can breathe while its stored and keep it in a place where it’s not compressed. Avoid plastic bags and when it’s time to pull out your comforter for the new season, give it a shake or two and it should be good to go! Down comforters are durable, easy to clean, and a guaranteed good night's rest. With a good duvet cover, a wash now and then, and careful daily maintenance you’ll have that guaranteed warmth for a lifetime!